We now have only a few of our Organic Black Welsh Mountain Sheepskin rugs left. The Black Welsh Mountain lambs are sold through our meat business, as their meat is renowned for its flavour. The skins are retained and organically tanned at an experienced “on farm” tannery which is the only one in the British Isles with organic registration. The tannin used by them is an extract of Mimosa Bark, which leaves the skins soft and machine washable – with the fleece as nature intended and friendly to people, babies and animals. During the Middle Ages the Black Friars kept many flocks of black sheep, and used their fine quality wool to make their own habits. 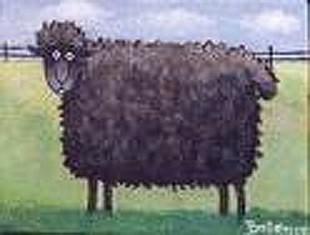 The black wool is referred to as cochddu (reddish brown – from coch = red, du = black) because the tip of the wool bleaches in the summer sunshine and becomes reddish brown, thus making each lambskin unique. The rugs sold from the Plas Coedana flock are completely natural and free from artificial dyes. Each rug is unique. Prices start from £85.00 plus carriage. Spin out as hard as possible. Add a little conditioner to final rinse. To dry --- hang out on washing line with fleece side out. e.g. over back of chair but NOT on radiators.